Saint Mary's Cathedral Basilica was targetted with the now-familiar variation on the anarchy symbol. Vandals also tagged a side door, the parking lot and some signage. 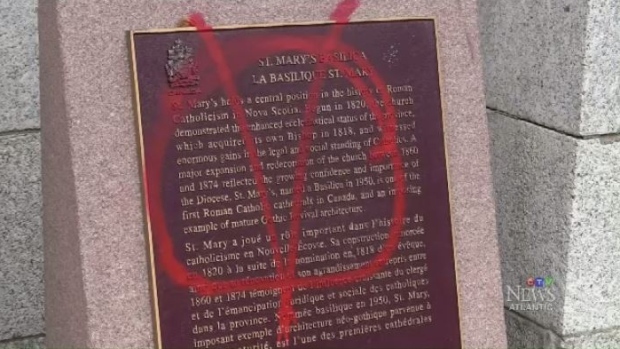 There was another graffiti spree in Halifax overnight and, once again, a Roman Catholic church bore the brunt of it. Saint Mary's Cathedral Basilica was targetted with the now-familiar variation on the anarchy symbol. Vandals also tagged a side door, the parking lot and some signage. The entranceway to the Archdiocesan office around the corner was also singled out. The archbishop was first to notice the damage when he went to work early this morning. Halifax police spokesman John MacLeod said they have looked into the vandalism. Vandals also tagged some property markers at the Halifax Grammar School and a stone wall and some signage at Saint Mary’s University across the street. With files from CTV Atlantic's Bruce Frisko.